anybody own a razor mx500 or 650 or the mototec 500w ? they appear to be comparable kids toys, we have a couple razor scooters so when they say 45minute runtime and 220 lb capable i know that means about 15 minute runtime and if your 220lbs expect about half the top speed, so im looking for additional feedback on either bike, i want something the kids can run around the house with and not be fixing it evryother use. We have a Mototec. It is a decent electric bike. My kids friends will ride it when we bring them with us on trail rides. It handles easy and intermediate trails well, but hills will kill the battery. About an hour+ battery life around the neighborhood and 30 to 45 mins on the trail. Rear suspension is pretty good, front suspension on ours is non-existent even though there are springs in the fork legs. I broke off one of the pegs when I was riding it (220lbs). The frame tubing is very thin so I welded the peg to some 1" square tubing and then welded the square tubing to the frame. I've only handled the Razor electric bikes, but the frames seem to be more robust than the Mototec. I think most of the Razor bikes don't have any suspension, though it does look like the 650 you posted does have suspension. GV thanks for the reply the mototec looks more like a real dirt bike, but the amazon reviews are mostly meh and the larger 650 or 1k watt bike is unavailible ? anyway i pulled the trigger on the razor just because they have been around a while and have made these bikes a while so parts and support should not be hard to come by if needed. Ill report back once the kids ~4' 60 lbs get some time on the bike !!! If I were to buy another lower cost electric, I think I'd go with the 650 too. Or I would step up to a kuberg or oset. 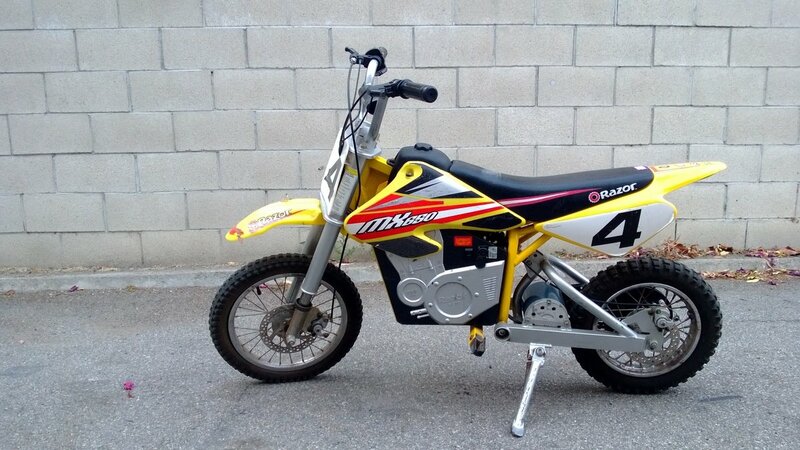 GasGas also has an electric dirtbike. these other bikes are much more sophisticated (and expensive) than the razor. We did get the 650 razor and its a good kids toy. It has mechanical disc brakes (vs hydraulic) on real bikes. I was able to easily lock up the rear wheel w me riding it so brakes work fine im just commenting they are not hydraulic. it has spring loaded suspension but it doesnt appear to be hydraulically damped. It works good and goes 17ish mph. the first several charges have lasted about an hour. if your hoping for the latest tech the other bikes listed above may suit you better, but for a kids around the house toy thats not going to be thrashed thru mud and left outside i recommend the razor its reasonably well made and performs as advertised.